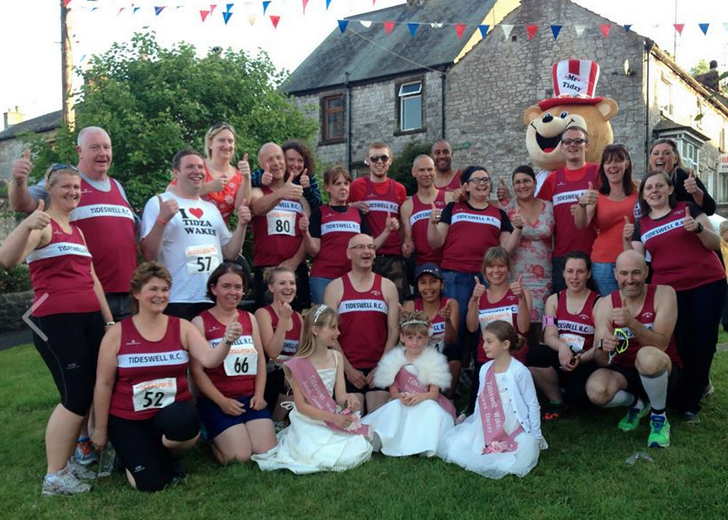 Tideswell Running Club is a friendly running club for people of all abilities, who are based in or around Tideswell in the beautiful, Derbyshire Peak District. If you are thinking of joining us, testimonials from club members can be found here. We organise the Inter Inns run during Wakes week in June. We are affiliated to England Athletics, so members can obtain personal race licenses and enjoy other affiliation benefits. We meet at 7pm every Monday and Wednesday, usually at Fountain Square Bus Shelter, Tideswell. To vary our running routes and see more of the beautiful Derbyshire countryside we schedule regular away runs, meeting at a range of locations within a short drive of Tideswell. During the summer this is often used to recce upcoming fell races. Occasionally we meet at Millers Dale Station Car Park (SK17 8SN) to run on the Monsal Trail, where there is the opportunity to do a speed intervals session (or an out-and-back run). An informal running club meeting is held on the last Wednesday of the month, when sandwiches and chips are served in “The Star” after the normal club session.